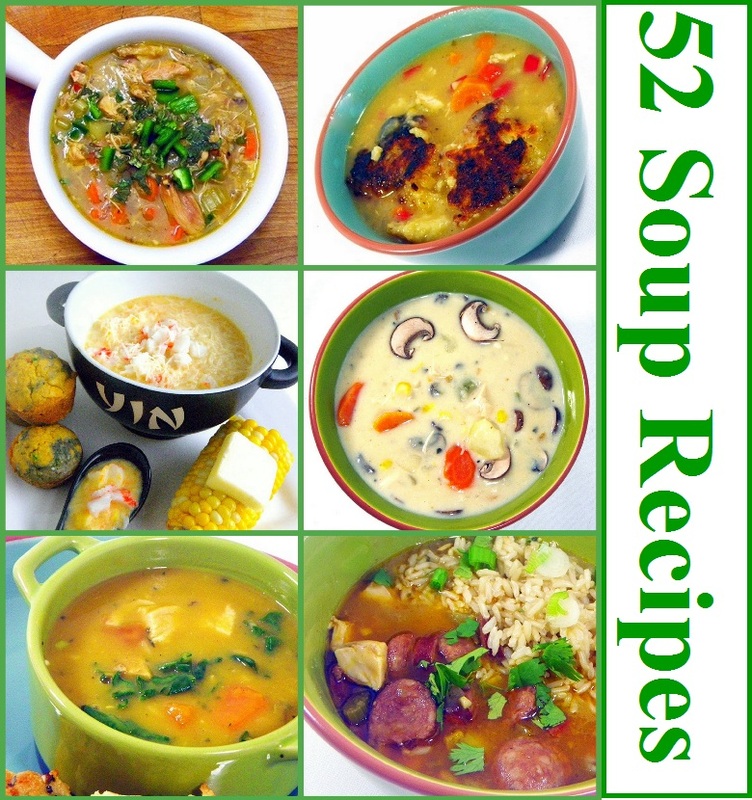 52 Soup Recipes... What I've been doing! Have you been wondering what I've been up to on my current site??? Take a look... I just finished a year of soup! 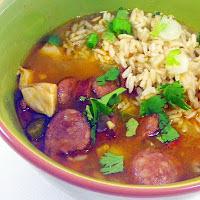 Creamy, Stews, Lots of Chicken, Ethnic and so much more (Check out the Chicken Sausage Gumbo). Take a look, Something may warm your imagination and of course, double click on the Blue Letters to see a recipe. a full meal in it self or as a starter course for a fancy dinner. From incredibly easy (and VERY inexpensive) Tomato Soups (I seem to collect different Tomato Soup Recipes... Love em all), to Hearty man foods like Gumbos to a more complicated chowder or Bisque, I can not get enough! I use Chicken Stock in LOTS of dishes. From Rice and Risotto, Soup and even in a few of my mashed potato recipes. 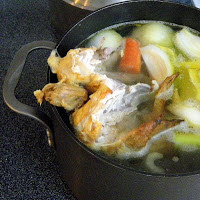 By using fresh made (but easily frozen) chicken stock made from the bones, I easily add $3-$4 value in that $5 bird! And you just can not make many soups without making your own Stock! A must for any serious soup maker. A hearty stew, Cajun roots, memories of New Orleans and just about the tastiest Gumbo you have ever had. Perfect as the weather turns colder! 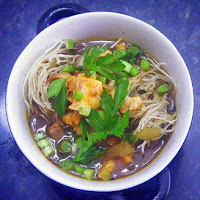 Shhhh... Keep it secret, you really do not need a recipe for chicken soup... Take a look, easy as can be. So FILLED with garlic i named it twice... Includes a recipe for copy cat "Red Lobster Cheesy Garlic Rolls" that I use as dumplings, A delicious on it's own garlic chicken vegetable soup made double good with the addition of the garlic cheese dumplings! My new favorite recipe... maybe of all time! OK, yesterday I posted MY FAVORITE... Today I am posting my wife's favorite... Thick and creamy and cheesy and LOADED with seasonal root vegetables (and a frozen one)! Stick to your ribs soup! A day trip across the state to a Cheese Shop ended with a Soup Party... Make a soup bar with lots of sides to "pimp out" the soup of your dreams! 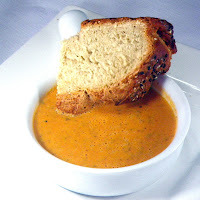 Fun idea for a party and a GREAT SOUP! Stew??? Soup??? Nah, this is Chili! It's going to be one of those days... Perfect for that cook as you multi-task with a crock pot... "Cause if it ain't ready by 6 AM, We are not eating tonight". Delicious blending of vegetables and seasonings! More than a tomato soup, LOADED up with extra vegetables, perfect after a visit to a farmer's market! Fall is in the air! Here's a wonderful silky smooth pureed Butternut Squash soup, LOADED with Sweet Potatoes, Kale and Chicken. Seasoned and served hot for those shockingly cold snaps coming! The extra TANG of buttermilk sets this above the rest! Deliciously creamy and sharp cheddar along with enough vegetables to almost make it healthy! No Super Bowl party is complete without it! 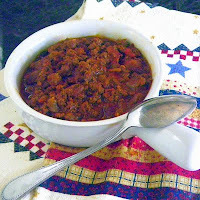 Chili - basic, but it is the best thing my wife makes for me!!! I LOVE this chili... Simple recipe but about as comforting as it gets. VERY easy and delicious. I could eat this everyday (if she cooked for me)! It is so easy I am embarrassed to do a blog post. But, here it is in all of it's 4 ingredient splendor! It started as a copy cat recipe for the Chili's Restaurant classic, evolved into... Well, better is in the taste buds of the beholder, but I LOVED this. Real taste of a Tex Mex Enchilada in a soup... Stew! I just love tomato soup! And this version has a hint of Asian heat with the wonderful Sriracha sauce, softened with cream and blue cheese! I even tossed in a recipe for my version of Herbes de Provence! Nothing like a big hearty bowl of stick to your ribs cheesy CHOWDER on a cold Fall day! Creamy , cheesy, filled with vegetables and meat, hints of heat and warming to the core! It's a beautiful thing, just grab a bunch of different seasonal vegetables, add some stock, cream and seasoning and you have a delicious thick Fall Classic! BONUS... morning after Root Vegetable Potato Stew Recipe enclosed in the post. A few exotic yet easy to find ingredients makes this soup not only accessible but WONDERFULLY delicious. Hints of Asian cuisine with sweet and mildly spicy flavors. Loaded with vegetables and chicken. LOVE IT! I LOVE a good French onion Soup, but usually it is just a simple broth. I zipped this up a tad with a few secrets to make the broth worthy of the dish! A fun soup, made special with sriracha sauce and made fun with a BIRD's NEST of glass noodles that cook as you serve the soup. Easy and FAST and exotic enough to impress! How could I have not made this sooner? Absolutely one of my favorite meals, from an authentic recipe fresh from a visit to New Orleans. LOADED with spicy sausage and chicken... Seasoned vegetables and rice! One pot meal, ready in less than an hour and better the next day (make plenty for leftovers)! Soup??? Sure, why not After all, anything that uses 5 cups of Chicken Stock can't be dismissed so quickly as not a soup... Can it??? Started out as a copy cat recipe of an Olive garden favorite, made thicker and heartier with the subtraction of some of the liquid )almost a stew now) and a few more changes. Made easier as a crock pot recipe. WORKS GREAT! now one of my favorites! An adapted Taste from the Island Mon! The distinctive taste of Jamaican Jerk Chicken, combined with lots of vegetables to make a delicious stew! It's a grown up savory delicious hearty thick creamy soup. Made in a crock pot for easy no fuss, ready at the end of a hard day soup! 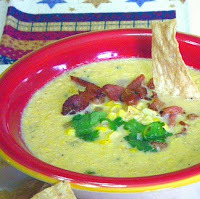 Corn Chowder with Roasted Jalapeno Peppers and BACON! 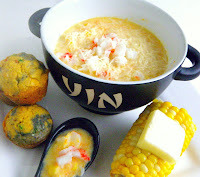 A seriously grown up chowder with plenty of spice and sweet corn balance. Recipe posted with permission from the Homesick Texan Cookbook! About as good as it gets! This was unexpected. I started making something different and ended up with a creamy tomato soup just LOADED up with vegetables and a nice Kielbasa. I added Cream Cheese to make it even more delicious! A New FAVORITE! Easy as could be. I made a Cream of Mushroom base, cooked everything in a crock pot (including the rice!) and warm comforting food. LOTS and LOTS of cheese... YUM! This is an "On Sale" recipe. The sausage was on sale, I used a brick of cream cheese (on sale). The chicken stock was made from leftover Rotisserie Chicken (Bought on sale) bones. BUT... It was delicious, hearty and filled with MEAT! Love this! 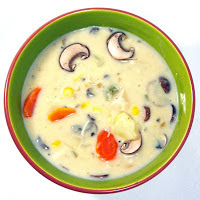 An unusual, creamy sweet yet Earthy savory soup. South African recipe gets a creamy update for a unique combination of flavors that works PERFECT! Used a pesto/mozzarella toasted cheese sandwich as croutons made a delicious inexpensive dinner/lunch and a bit left over to freeze for later! The FLU has reared it's ugly head around our house. But this LOADED up vegetable-potato soup with a big wallop of Italian BACON helps in so many ways! This is the chili of my youth. Rich thick, delicious and comfort food. Yes it has beans, but that's what i like. Yes it uses hamburger but that's what I like. This is a bright, beautiful soup. Light in taste with just a hint of the sweet Italian cream cheese (which also helps to thicken the broth for a very pleasing texture. And of course, LOVE the colors. Meatless Mondays do not need to be bland Mondays. This soup packed a lot of flavors. 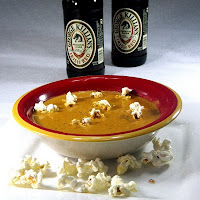 This is LOADED with vegetables, pureed into a bisque and then flavored and seasoned with herbs, BEER and LOTS and LOTS of Cheese. The hint of buttermilk just adds to the layers of flavors! 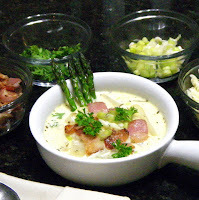 This has one terrific creamy cheesy potato soup recipe but also a wonderful idea for a party... Make the basic soup and load up with a half dozen (or more) ingredients so your guests can make exactly the soup they want... Everyone loves your cooking this way! A MOST unexpected soup. DO NOT BE AFRAID OF THE SPELT. It is a grain, looks similar to barley BUT when slow cooked become sweet like a kernel of sweet corn. Combined with a SPICY Pepper Salami Soup, this becomes unexpected and FANTASTIC!!! My ongoing collection of tomato soups grows with this amazing rich thick chunky pizza spiced wonderful pottage! Made easy in a set and forget crock pot, with an extra texture from Sun Dried Tomatoes the layers of flavors from the Italian spices sets this apart! A One pot wonder that is more stew than soup. The starchy water combines with dry white wine to make a fantastic gravy, along with mounds of sausage and plenty of BACON! The unique taste of the Cranberry beans makes this a winning cold weather dish! Apple Cheddar Cheese Soup with BACON BACON BACON! This is such a WONDERFUL SOUP... Very pretty color and looks fantastic with the garnish. But of course the taste is what I really like... Little tart from the apples, salty and savory from the bacon, Cheesy deliciousness and of course BACON BACON BACON! Absolutely DELICIOUS loaded with shrimp and sweet artichokes, seasoned with Creole/Cajun spices . A version taught at the New Orleans School of Cooking and AMAZING!!! Here's a FAST FOOD recipe... Even Better, A Fast Food DOLLAR MENU item. It costs next to nothing to make but filled with flavors. 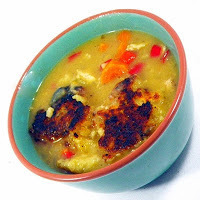 This is the Italian version of an Asia Egg Drop Soup with one special ingredient that adds nutty freshness to the soup! This is as hearty a soup as you can get. TWO kinds of Sausages, two Beans, two Root Vegetables, EVEN more vegetables, Tomatoes, all in a Tomato based broth... Even Orzo Pasta FANTASTIC FILLING HEARTY SOUP! A new twist on a creamy vegetable soup with HOT SAUCE added an crunchy Poblano Pepper strips to make this a step above the ordinary. Made easy in a crock pot. Wonderfully spicy and delicious! 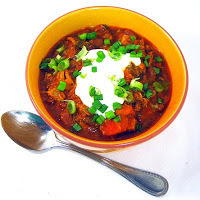 Fortune Favors the BOLD BEER CHILI... A malty British style PORTER beer adds heft to this tomato based BOLDLY SPICED CHILI... Best I have ever had! It says it all... Flavored with a Bristish style Porter beer, LOADED with crispy salty specialty (Honey Chipotle Glazed Bacon thank you very much!!!)... Packed with Cheese flavors and it even has a couple pounds of vegetables pureed into the mix... BOLD, FLAVORFUL and BACON BACON BACON BACON (and beer)! And BEER... The alcohol cooks out leaving a hearty delicious malty taste! FRESH Tomato Tomato Soup... What's better than a Tomato Soup??? how about a big Crock Pot filled with soup made from fresh from the vine (Farmer's Market, your neighbor's garden or even your own vines) TOMATOES! LOADED with flavors unlike the canned. Simply delicious the way it should be! 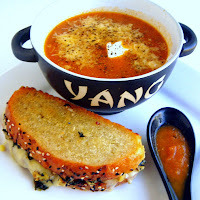 This suddenly became one of my very FAVORITE SOUPS! LOADED with flavors from the rice cooked in beer (optional to use chicken stock if you prefer) to the fresh tomatoes and so much meat it is almost a hamburger stew. Colorful, beautiful and fantastic FLAVORS, crock pot EASY! Philly Inspired BEER CHEESESTEAK SOUP (or is it Cheese Steak???) 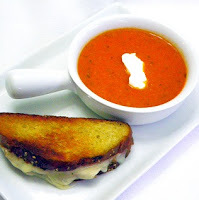 - Cooking with Beer and one of my 52 Soup Recipes... Of course the inspiration is the classic Philly Cheese Steak sandwich! The Sandwich that puts the LOVE in the city of Brotherly Love! Steak, Peppers and Onions, lots of Cheese and top everything off with a golden brown and delicious piece of garlic toast! Hearty, rib sticking, beautiful, filling and DELICIOUS!!! This seemingly complex tasting designer soup is AMAZING. But the Amazing part is that the ingredients are simple, easy to find (you probably have most in your pantry right now). Simple matter of opening a few jars, heat and mix and add cooked Tortellini. THIS IS A KEEPER! HEARTY FILLING AND ALL THE FLAVORS OF A SUMMER BBQ... Made easy with a store bought fully cooked fully seasoned Rotisserie Chicken. It's the BBQ Sauced Broth that really sends this over the top. EASY, FAST and just right for a COLD NIGHT!!! And keep coming back often... I will be making at least one new soup a week and posting the links here. I will be emphasizing fresh, local and seasonal when possible, but always something delicious and special. Soups really are easy and worth trying. And on those days (cold, windy, blustery)... What could be better than a hearty bowl of hot soup?? ?